Old New England slaws weren’t the colorful mixtures we known today, but rather something like this version, with shredded cabbage, cucumbers, scallions, and celery, dressed with mayonnaise diluted with cider vinegar. Shred the cabbage and cukes with a mandoline or hand-held slicer (or use the slicing disk in a food processor) or a chef’s knife. To rid the cabbage of excess moisture, layer the cut cabbage and cucumbers with salt in a bowl. Let them sit for half an hour, then cover the bowl with a pan lid and tip out the excess moisture. 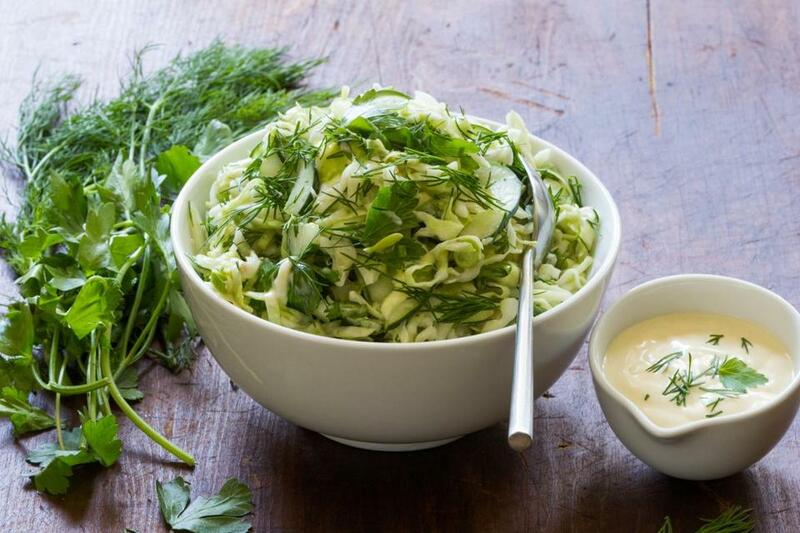 Whole parsley leaves and dill add more green elements to the bowl. The recipe doubles easily for a crowd. 1. Cut the cabbage half into 3 pieces, each one attached to some of the core. Using a mandoline or other hand-held slicer or a chef’s knife, cut the cabbage into fine strips, discarding the core. Transfer to a large bowl, sprinkling the layers with most of the 1 teaspoon salt. 2. Without peeling them, halve the large or small cucumbers lengthwise and use a small spoon to scoop out and discard the seeds. Using the slicer, cut the cucumbers into half-moons and add to the cabbage, sprinkling them lightly with the remaining salt. Set aside for 30 minutes to drain. 3. Set a pan lid inside the colander so it fits snugly. Tip the bowl and lid so any water in the cabbage is discarded. 4. Add the celery, scallions, parsley, and dill to the cabbage and toss well.